Ready for a little Italian conversation class? Start by repeating after me: Bella piccolo macchina. Now say it with feeling, and maybe with an Italian-style shrug of the shoulders and upturned palms. The literal translation is 'beautiful little machine'. 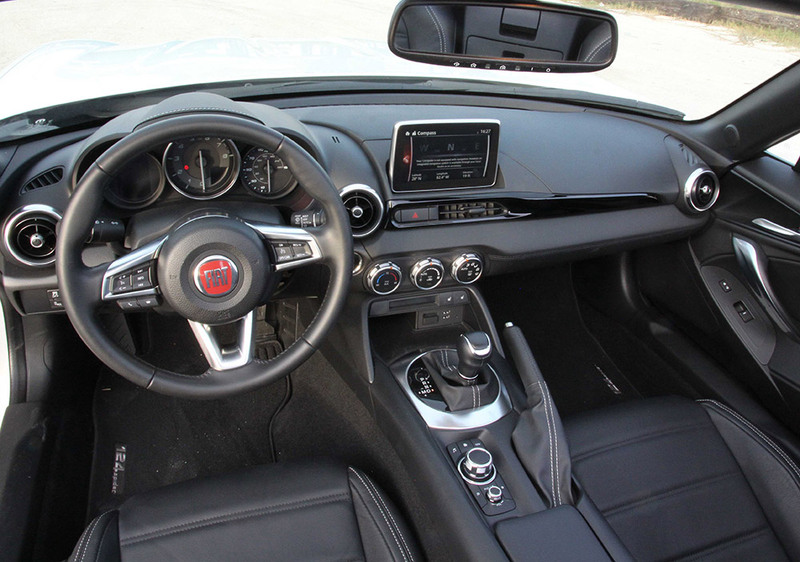 And it's also exactly how you'd describe Fiat's new magnifico 124 Spider two-seater. Bella indeed. You might have heard about this new 124. It was developed hand-in-hand with Mazda - yep, I scratched my head too when I first read that piece of news. Fiat borrowed the underbody structure of Mazda's much-loved Miata MX-5 and wrapped it with its own bodyshell - every panel is unique to the 124 - and squeezed in its own piccolo engine. Just don't call it a Fiata. Makes sense. These days small, affordable, old-school sports cars - even with $25-grand starting stickers - sell about as well as electric typewriters and Filofax planners. So it was tough for Fiat to justify going it alone to build a new 124. Split the costs with Mazda, send the two cars down the same production line in Japan, and the proposition becomes a lot more financially sound. As much as I love the little MX-5, I have more amore for this little Fiat. 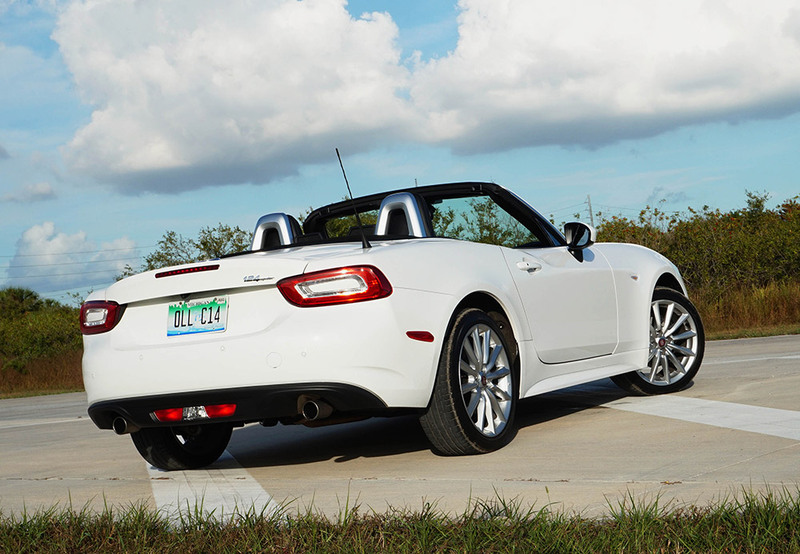 It has oodles of styling cues from Fiat's classic '70s 124 Spider - the twin power bulges on the hood, the distinctive front grille, rear fenders that look like Joan Collins' shoulder-pads in Dynasty. It's also around five inches longer than the Mazda, which somehow makes it feel less dainty, more substantial. And while it would have been so much easier for Fiat to stick with the MX-5's trusty 2-0-liter SkyActive four-banger, full credit to them for wanting to use their own 1.4-liter Multiair turbo from the plucky Fiat 500 Abarth. Not that there's much difference in power; 160-hp for the Fiat, 155 for the Mazda, though the 124 gets a 36 lb-ft hike in torque which kinda counters the Fiat's extra 100 pounds in weight. Swings and roundabouts. Thankfully they stuck with the MX-5's brilliant folding canvas top. To me, it's still the benchmark for a manual roof. Flip a lever, flip the top back to stow on the rear deck, 10 seconds max. And you do it with one hand. While in the car. So what's it like to drive? Bellissimo. The whole point of a two-seater like this is for it to be fun, and to put a big smile on your face. And the little Fiat delivers. The turbo engine provides a ton of thrust to get you off the line fast, to zip you past slower traffic, and to punch you out of a tight bend. Interestingly our tester came with a six-speed automatic rather than the knife-through-butter-precise six-speed stick. My initial reaction was 'no way'. But for our arrow-straight, traffic-congested Florida roads, it makes perfect sense. The shifts are smooth, it's eager to kickdown and there's manual shifting if you feel the need. 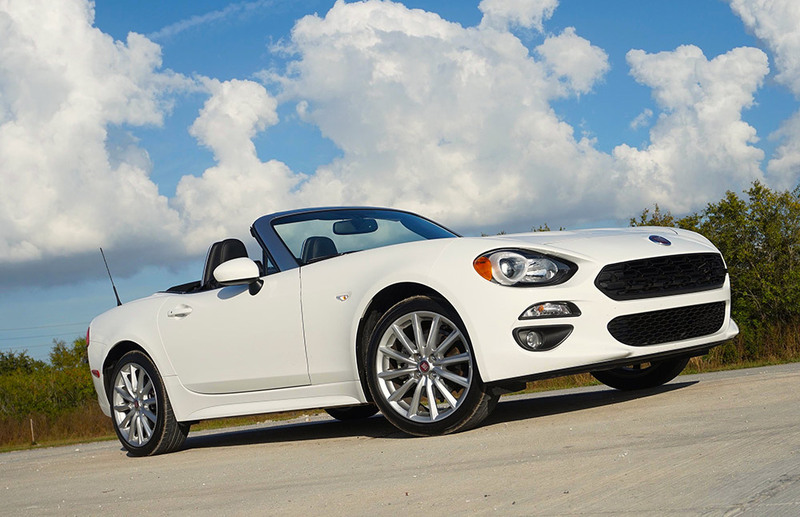 Fiat offers three 124 Spiders to choose from. The base Classica kicks off at $24,995. Then there's the leather-trimmed Lusso I've been driving with the bigger 17-inch alloys and silver windshield surround. For performance fans, there's the feistier 124 Abarth with tighter suspension that starts at $28,195. Why would you buy a 124 Spider? 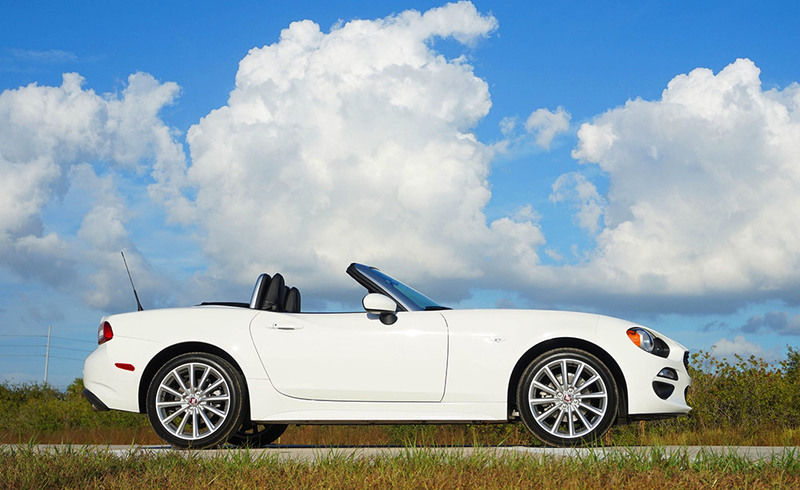 It's a fun, affordable 'toy' that's a blast to drive, especially top-down on a blue-sky Florida winter day. And if you remember with affection the old 124 Spider, this car will rekindle those nostalgic memories. Read more on Palm Beach Illustrated.